Moles are common skin lesions made up of aggregated melanin, a biological pigment that makes moles dark brown or black in color. A team of researchers has reported that they have created an artificial mole. Apparently, this form of bio-implant activates melanin to make a characteristic blemish form on the skin, just like the real thing. This "mole" also responds to cancer biomarkers. The function is intended as an extreme early-warning system for those at risk of four major cancer types. The scientists developed this mole with the aim of expediting treatment, if necessary, as this may also enhance survival in some cases. The synthetic mole is, in fact, an implant that is placed just under the skin. It deploys a biological network of engineered genes, which is capable of inducing the production of melanin in response to an elevated cancer biomarker. The researchers decided on blood calcium levels as a biomarker since it is regulated by a range of proteins and other molecules that may become dysregulated, in case of cancer. In this way, the implant was designed to detect some exceptionally common cancer types - breast, prostate, lung, and colon. 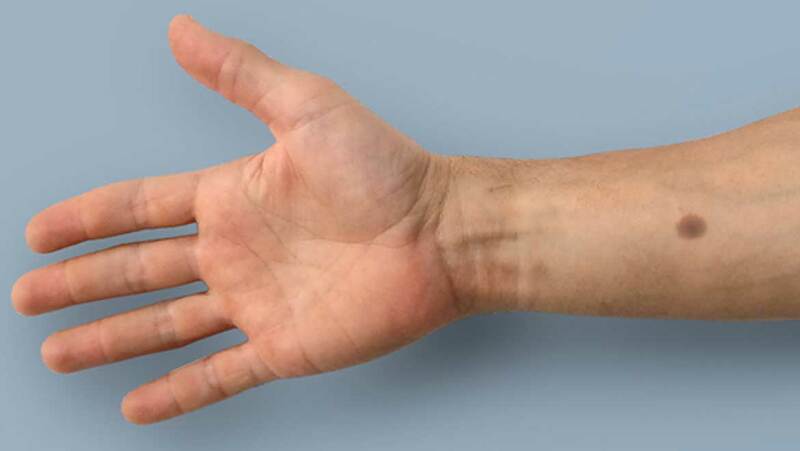 The artificial mole was innovated by Professor Martin Fussenegger and his team at ETH Zurich. They developed the concept due to observations in the past that early detection of such cancers can result in improved survival rates and reductions in healthcare costs and resources. For example, the timely detection of breast cancer can result in chances of recovery as high as 98%. Delayed detection, on the other hand, may reduce these chances to approximately 25%. Therefore, people with an increased risk of such tumors (e.g. through family medical history) could have one of these pseudo-moles implanted for enhanced health monitoring and tracking. These implants will also be presented in a paper in an April 2018 issue of the journal, Science Translational Medicine. The document will detail the development of the synthetic mole as a proof-of-concept. This study involved the implant's development and testing, consisting of the gene network and living human cells in animal studies. They took the form of in vitro (prepared pigskin) and in vivo (mice) models. The preliminary findings enabled the scientists to conclude that the moles were activated (which involved their turning into a round, brown mark) in response to very high calcium levels. Prof. Fussenegger noted that an 'activated' mole does not automatically mean the presence of a tumor, in all cases. It only means that the wearer is best advised to get a check-up. However, the ability to self-monitor the implant is also likely to reduce overall costs, as the Swiss researcher asserts. Additionally, he conceded that not everyone will like the idea of having to monitor mole. But for these cases, the melanin in the implant's system could be switched out for an alternative indicator molecule only visible under red light. Checking implants could potentially become a part of regular doctors’ appointments. The professor also admitted that his team does not have access to funds and resources for large-scale research, presently. Although, he accepted to be willing to partner with other groups in translational medicine in order to take the synthetic mole towards real-life clinical use. On the other hand, these efforts would have to tackle a disadvantage of the implants - the cells in each 'mole' only last a year, at the most. Hopefully, the process that integrates them into each implant (encapsulation) will improve its longevity. A team of researchers based in Switzerland have developed an innovative 'mole' in which melanin accumulates in response to increased calcium levels in their vicinity. Elevated blood calcium may indicate the presence of a tumor. Therefore, a high-risk patient could use such an implant to monitor early warning signs of the cancer. But, it is to be kept in mind that the synthetic moles are still in relatively elementary stages of testing.